It may just be that we've headed that much further south and so we're a little more sun-drenched than we were in Burgundy (to which the region is annexed, if you like), but these delicious wines are sunny in nature, with a natural charm and delight that is difficult to resist. That hauntingly perfumed Gamay Noir grape that fuels the flavour of the wines in question is unquestionably drinkable, displaying the cherry/berry profile of Pinot without the fuss. 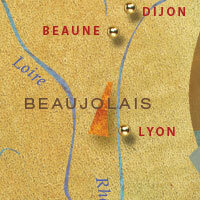 Beaujolais adopts a similar appellation system to Burgundy, with excellent single-vineyard wines named on the label, and villages-appellation flag bearers providing good value while still showcasing what makes the region great. The producer with whom we are most associated is Georges Duboeuf. Known as the King of Beaujolais, his vineyard holdings, output and quality outstrip virtually all the other contenders put together. He is the man, these are his wines.